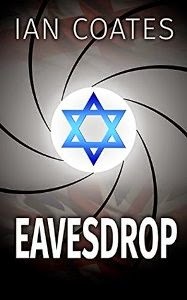 A blue-tinted Star of David features prominently on the cover, but although Eavesdrop by Ian Coates is described as a Mossad spy thriller, there is very little Mossad about it. Instead, this is the story of James Winter, a former MI5 operative now chasing smugglers on the coast of England. After several of Winter's operations fail to produce results, he is accused of collaborating with a smuggling ring. With his wife hospitalized for cancer treatments, Winter finds it difficult to clear his name. Assuming that the smugglers have bugged communication devices, Winter teams up with Lynne Douglas, an executive at the firm which produced the radios. Heading to Finland, where the second half of this novel takes place, Winter and Douglas discover a plan by terrorists to attack delegates at Israeli-Syrian peace talks. The Syrians have a hit team afoot in Helsinki, and there appears more to their plan than what initially meets the eye. The novel's lone Mossad agent, once assumed to be a bad guy, is killed, leaving only Winter to alert authorities and stop a major assassination. An overwhelming amount of snow covers the ground, making the protagonist's surname quite appropriate for his wintry adventures. Miraculously, Winter escapes a severe case of frostbite despite all of his escapades in sub-zero temperatures. Yet despite his heroic, but somewhat foolhardy efforts in the snow, we cannot help but sympathize with Winter’s struggles to vindicate himself while tending to his ailing wife. 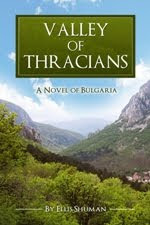 However, we totally fail to connect with Douglas, who is described as having a whiff of alcohol on her breath most of the book. Particularly disturbing are the frequent derogatory references to the Mossad operative as "the Jew", but on the other hand, the story's bad guys are referred to repeatedly as "the Syrians". Eavesdrop (Bad Day Books, the suspense and thriller imprint of Assent Publishing, December 2014), is a fast-paced page-turner. 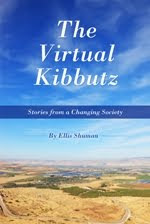 It is not a Mossad thriller, but rather a novel of suspense circling round a disgraced Customs officer who will stop at nothing to prove his innocence. Author Ian Coates has extensive experience in the high tech electronics industry, where he specialized in the design of radio communication equipment. Named one of the winners in the Writers' & Artists' Yearbook centenary novel writing competition, his debut novel was written largely on planes and in airport lounges as well as in snatched moments before starting work each morning. Coates lives and writes in Buckinghamshire, England, with his wife and two daughters. Buy Eavesdrop and read it now. Why I Offered My Book for Free. Again.